Beetroot (Beta vulgaris) has been used as a treatment for various digestion and blood-related conditions since the Middle Ages. Today, studies indicate that beet juice can potentially cleanse the blood of heavy metals, fight diabetes, support brain health, and even reduce blood pressure. The benefits of beet juice for high blood pressure will be featured in this article. Beet juice is likely able to increase blood flow and reduce blood pressure due to its inorganic nitrate content being converted to nitric oxide in the body. Research also shows that beet juice could lower both systolic and diastolic blood pressure levels. Beet juice may also lower blood pressure due to its rich antioxidant content, as well as other antihypertensive nutrients like potassium and magnesium. Furthermore, beet juice could control blood pressure by keeping atherosclerosis in check, treating peripheral vascular disease, and improving muscle oxygenation during exercise. The good news is that research shows that just one glass of beet juice daily can do a lot to lower blood pressure in hypertensive patients. Let’s dig deeper into how beet juice is used for high blood pressure. How Does Beetroot Juice Lower Blood Pressure? Many people consume beet juice for high blood pressure. That being said, how do beets lower blood pressure, according to science? A study published in the British Journal of Nutrition in 2012 found that a low beetroot dose would show significant blood pressure-lowering effects. The study results suggested that beetroot consumption reduced diastolic blood pressure when the heart muscle relaxed and systolic blood pressure when the heart muscles contracted over a 24-hour period. Another study published in the Nutrition Journal in 2012 analyzed 15 women and 15 men who were given 500 grams (g) of apple and beet juice or a placebo juice. The results found that the apple and beet juice had reduced systolic blood pressure, after a blood pressure measurement six hours from the juice consumption. This section will guide you through the many ways beet juice reduces blood pressure. Beetroot has high inorganic nitrate (NO3) levels, since beetroots absorb nitrate from the soil in a way similar to other foods like lettuce, cabbage, celery, leeks, parsley, dill, spinach, and turnips. When you eat these foods, the body will convert NO3 into biologically active nitrite (NO2) and nitric oxide (NO). The nitric oxide will then relax and dilate the blood vessels, and this promotes both blood pressure reduction and blood flow. An interesting study published in the journal Hypertension in 2015 was the first study of its kind to show a lasting blood pressure reduction due to dietary nitrates. The results found that the patients taking the inorganic nitrate beetroot juice had experienced a 20% increase in blood vessel dilation, while artery stiffness also decreased by about 10%. In the previously mentioned 2015 study, after four weeks, the patients drinking the inorganic nitrate beet juice had experienced a blood pressure reduction of 8/4 mmHg (millimeter of mercury). The first number is the systolic pressure when the heart has contracted, while the second number is the diastolic pressure when the heart has relaxed between heartbeats. The study would include 64 patients between the ages of 18 and 85. Half the patients had been diagnosed with hypertension but were not taking medication, while the other half were taking hypertensive drugs for high blood pressure but had not yet reached their blood pressure target goal. One group had 250 ml (one cup) of beet juice, and the other group had the same amount of nitrate-free beet juice. For most of the patients, the blood pressure reduction brought their blood pressure to normal range. However, patients’ blood pressure had returned to their previous high levels in the two weeks after they stopped taking the beet juice. A meta-analysis of 16 trials published in The Journal of Nutrition in 2013 also found that inorganic nitrate and beetroot juice was linked to a major systolic blood pressure reduction. When compared to beets, drinking beet juice also provides a greater boost of antioxidants like vitamin C, vitamin E, phenolic acids, phytoestrogens, and carotenes. As a result, this improves both immune and cardiac function, which can help reduce high blood pressure. Beetroot is particularly high in a group of nitrogen-containing color compounds and antioxidants called betalains. Betalains can be divided into two categories: Red and purple betacyannins are responsible for the red beet, whereas the yellow and orange betaxanthins contribute to the yellow beet. Research suggests that belatains can protect against oxidative stress-related conditions like cardiovascular disease and high blood pressure. Beet juice also contains a number of other blood pressure-lowering nutrients like potassium, calcium, and magnesium. Atherosclerosis is one of the more serious health problems associated with high blood pressure. Research shows that the betalains in beetroot can also help treat atherosclerosis by controlling LDL (low-density lipoprotein) cholesterol oxidation levels. A study from 2000 found that beet fiber would reduce LDL levels and increase HDL (high-density lipoprotein) cholesterol levels while also reducing 30% cholesterol plaque accumulation in the aorta of animals fed the beet fiber. Peripheral vascular disease is a stiffening-of-the-arteries condition that leads to an inadequate blood and oxygen supply to the working tissues in the body that carry blood to the arms, legs, kidneys, and stomach. The inorganic nitrate in beetroot is essential for overall vascular health and function. Research published in the Journal of Applied Physiology in 2011 found that beet juice had benefited people aged 54 to 80 with peripheral vascular disease. Research shows that beet juice supplementation can improve muscle oxygenation during exercise, which suggests that increased nitrate intake in the diet can potentially enhance exercise tolerance in long-term endurance exercises. In other words, the quality of life of people with cardiovascular problems like high blood pressure due to poor oxygenation can be greatly improved. Juicing is a great way to get beets into the diet. It is a good idea to start with a few ounces each day, and gradually increase to more than a cup. A study published in the journal Hypertension in 2008 found that 500 ml (about two cups) of beetroot juice daily could significantly lower blood pressure. Blood pressure was reduced within just an hour of beetroot juice consumption. Peak reduction would also occur three to four hours after ingestion of the beet juice, and some degree of blood pressure reduction had continued up to 24 hours after juice consumption. To make beet juice for high blood pressure, try combining about three ounces with equal parts other nitrate-rich vegetables, such as lettuce, celery, parsley, and spinach. Beetroots come in red, golden, and white, and can often be found at farmer’s markets and grocery stores. Beets can be stored in the refrigerator in a tightly sealed bag for around three days. Raw: Beets are crunchy and firm when eaten raw. Sweet-tasting raw beets can be juiced, added to smoothies, or grated in salad or coleslaw. You can also slice raw beets and serve them with lemon juice and sprinkle on some chili powder. Cooked: Once cooked, beets take on a somewhat sweeter and softer taste. Cooked beets are often paired with goat cheese, arugula, and balsamic vinegar. Cooked beets are also used as a main ingredient in various dishes like borscht and soups. Roasted: Beets are naturally sweet due to their high sugar content, which makes them ideal for roasting. Since beets are a delicate vegetable, they will lose nutrient value when overcooked and overheated. Try to cook beets lightly since research shows their nutrients are delicate, and therefore high processing is best avoided. For instance, the betalain in beets is a particular phytonutrient reduced from high heat. Pickled: What about pickled beets for blood pressure? Although beets are often pickled or canned, this process can slightly change their taste and destroy some nutrient content. Pickled beets may also contribute to high blood pressure due to their high sodium content. Excess sodium consumption may increase blood pressure in certain people. Although the vegetable has important benefits, there are also beet juice blood pressure side effects and precautions to keep in mind. If nitrate-containing vegetable juice like beet juice is stored improperly, bacteria may contaminate the juice. Remember that the nitrates in beets convert to nitrites. High nitrite levels can be harmful when consumed. A high-nitrate diet can interact with various drugs like “Viagra” (sildenafil citrate), tadalafil, vardenafil, nitroglycerine (organic nitrate), or nitrite drugs used for angina. The oxalate content in beetroots prevents the body from absorbing calcium. This can lead to kidney stones; therefore, you may be advised to reduce oxalate foods in your diet such as beets. The oxalates in beets can also impair the absorption of non-heme iron. If you have concerns with your iron levels being either too high or too low and you’ve been feeling fatigued or sluggish, it may be a good idea to request an iron test from your doctor. You may also notice that your urine or stools turn red or pink after beet juice or beet consumption. This is often nothing to worry about and is completely normal. Approximately 15% of the population has this type of reaction to the compounds in beets. The next time your blood pressure is a little high, consider adding beet juice and beets to your diet. There are several benefits of beet juice for high blood pressure. You see, beets contain high nitrate content, which gets converted to biologically active nitrite and nitric oxide. In turn, nitric oxide is able to relax and dilate the blood vessels, which promotes a healthy blood flow and blood pressure. The rich antioxidant content and other antihypertensive nutrients can also help beet juice lower blood pressure. Beet juice may also control blood pressure by improving muscle oxygenation during exercise, treating peripheral vascular disease, and keeping atherosclerosis in check. Research indicates that all it takes is just one cup of beet juice daily to reduce your systolic and diastolic blood pressure levels. Hobbs, D., et al., “Blood pressure-lowering effects of beetroot juice and novel beetroot-enriched bread products in normotensive male subjects,” British Journal of Nutrition, Dec. 2012; 108(11): 2066-2074, doi: 10.1017/S000711451200190. Coles, L., et al., “Effect of beetroot juice on lowering blood pressure in free-living, disease-free adults: a randomized, placebo-controlled trial,” Nutrition Journal, Dec. 11, 2012; 11: 106, doi: 10.1186/1475-2891-11-106. Siervo, M., et al., “Inorganic Nitrate and Beetroot Juice Supplementation Reduces Blood Pressure in Adults: A Systematic Review and Meta-Analysis,” The Journal of Nutrition, April 17, 2013; 143(6): 818-826, doi: 10.3945/jn.112.170233. Kapil, V., et al., “Dietary Nitrate Provides Sustained Blood Pressure Lowering in Hypertensive Patients,” Hypertension, Feb. 2015; 65(2): 320-327, doi: 10.1161/HYPERTENSIONAHA.114.04675. 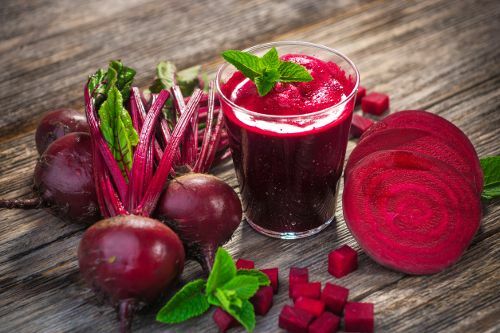 “Blood pressure-lowering effects of beetroot juice and novel beetroot-enriched bread products in normotensive male subjects,” Cambridge Core; https://www.cambridge.org/core/journals/british-journal-of-nutrition/article/blood-pressurelowering-effects-of-beetroot-juice-and-novel-beetrootenriched-bread-products-in-normotensive-male-subjects/A279E4CA6D2F11670393169077797420/core-reader, last accessed Jan. 3, 2018. Mateljan, G., The World’s Healthiest Foods: Essential Guide for the healthiest way of eating (Seattle: George Mateljan Foundation), 251. “Betalains: Atherosclerosis,” Examine; https://examine.com/supplements/betalains/, last accessed Jan. 3, 2018. Bobek, P., et al., “The effect of red beet (Beta vulgaris var. rubra) fiber on alimentary hypercholesterolemia and chemically induced colon carcinogenesis in rats,” Die Nahrung, June 2000; 44(33): 184-187, doi: 10.1002/1521-3803(20000501)44:3<184::AID-FOOD184>3.0.CO;2-P.
Kenjale, A., et al., “Dietary nitrate supplementation enhances exercise performance in peripheral arterial disease,” Journal of Applied Physiology, June 2011; 110(6): 1582-1591, doi: 10.1152/japplphysiol.00071.2011. Ware, M., “What are benefits of beetroot?” Medical News Today; https://www.medicalnewstoday.com/articles/277432.php?sr, last updated Feb. 23, 2017. Webb, A.J., et al., “Acute Blood Pressure Lowering, Vasoprotective, and Antiplatelet Properties of Dietary Nitrate via Bioconversion to Nitrite,” Hypertension, Feb. 20, 2008; 51: 784-790, doi: 10.1161/HYPERTENSIONAHA.107.103523. Bunch, J., “Benefits of Beet Juice in Controlling High Blood Pressure,” Everyday Health; https://www.everydayhealth.com/columns/jared-bunch-rhythm-of-life/how-drinking-beetroot-juice-lowers-blood-pressure-and-relaxes-stiff-hearts/, last accessed Jan. 3, 2018.